Today, thankfully, we’re getting something different. Not sea change different, but different enough to be interesting. Bears & Friends are a pretty large German confectioner who’s known (by me) for making excellently executed uncommonly flavored gummies. 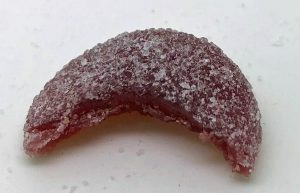 This time, it’s not a gummy, but a vegan jelly based candy. Say hello to Ginger Taler. 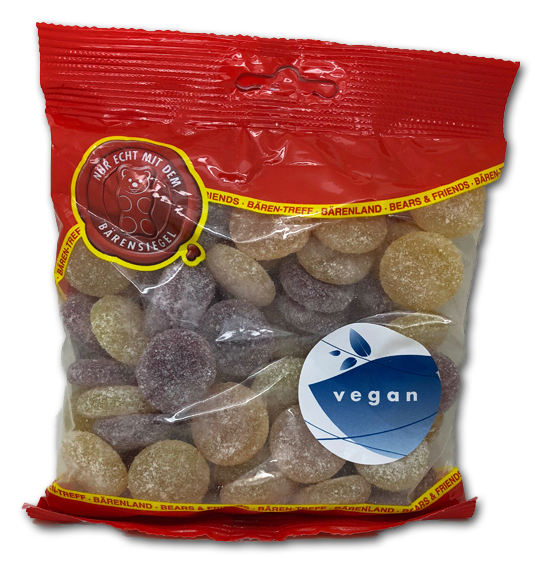 We’re seeing a lot more vegan candy because there’s more vegans (also quite a few chegans out there too (mostly vegan, but they cheat when they want to, which kind of could describe most of us, couldn’t it?) and also, “gummies” that don’t include gelatin are tasty in their own right. 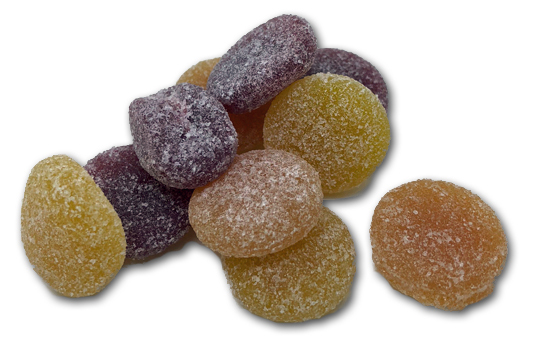 These are flavored cherry, orange and lemon, but all are mostly flavored with ginger. Full disclosure, when I first tried these, I didn’t love them. They’re intense, and like I alluded to before, the fruit flavor really is only complimentary to the ginger. You can see than when you bite, you bite clean through. It’s sproingy, but it’s not a gummy. There’s a smoothness to it that’s quite nice. If you’re not a ginger person, these clearly aren’t for you. Also if you don’t live in Germany, these aren’t for you either because you can’t get them here. Still though, I thought they’d be fun to review because they’re so unique. The door is wide open for other companies to mimic this kind of thing, yet the only ginger candy I ever see are Chimes or clones of Chimes. Chewy ginger candy is fine, but there’s other things to do with ginger. Maybe the vegans can show us the way. Their strawberry brains are KILLER if you can get a hold of them. Their sours are a bit disappointing texture wise. Strawberry brains eh? What do they taste like? Sour? Same consistency as these ginger things?